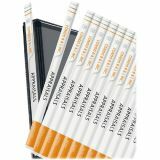 Label binder spines for an organized and professional look. Perforated cardstock allows for easy separation. Works best with Avery® Easy Insert™ Spine Binders. Can be used in all laser and inkjet printers. 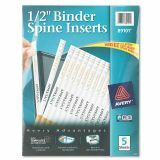 Avery Binder Spine Inserts, 1/2" Spine Width, 16 Inserts/Sheet, 5 Sheets/Pack - Show off the spine of a champion with these 1/2" Binder Spine Inserts. Microperforated sheets of cardstock separates easily for inserts with smooth clean lines, so you can label binder spines for meetings, clients, personal reference or any of a host of other uses. Customization is a snap with free templates available at avery.com, and you can print your completed spine inserts on either your laser or inkjet printer. 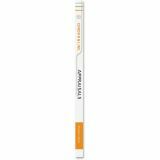 Slide the Binder Spine Inserts into your Easy Insert™ Spine Binders and stand straight and tall at any meeting. Customize spine inserts with free software and templates at avery.com.